Great Glacier Park, located downstream and across the Stikine River from Choquette Hot Springs Park, is visited by boaters for the outstanding views of the large ice tongue projecting into a peri-glacial lake. Protected in the low elevation peri-glacial ecosystems are uncommon plant species and old forest. Great Glacier Park also provides spectacular backcountry recreation opportunities, including glacier viewing, camping, hiking and canoeing in a peri-glacial lake. Bring your own drinking water as potable water is not available at this park. Great Glacier Park is approximately 120 km southwest of the community of Telegraph Creek and borders Alaska on its southwestern side. Access to the park is by boat on the Stikine River. History: A campsite at Great Glacier was previously a Forest Service Recreation Site before the Provincial Government designated Great Glacier as a Class A provincial park in 2001. Designation followed the recommendations of the Cassiar Iskut-Stikine Land and Resource Management Plan to protect the area in recognition of its scenic river-level glacier and spectacular peri-glacial lake. 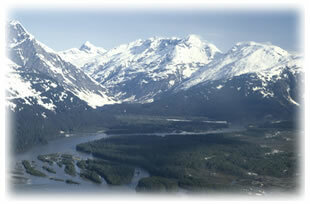 Cultural Heritage: Great Glacier Park is located within the asserted traditional territory of the Tahltan First Nation. The Stikine River is still used as a subsistence fishery. Conservation: Great Glacier park lies within the Boundary Ranges Ecosection. It projects a variety of low elevation peri-glacial ecosystems, including uncommon plant species and old forest. It is possible to portage from the Stikine River to the lake. A short trail (approximately one km) leads to the lake. For your own safety and the preservation of the park, obey posted signs and keep to designated trails. Shortcutting trails destroys plant life and soil structure. Backcountry areas are not suitable for dogs or other pets due to wildlife issues and the potential for problems with bears. If wishing to bring your pet, they must be on a leash at all times and are not allowed in beach areas or park buildings. You are responsible for their behaviour and must dispose of their excrement. While campfires are allowed and campfire rings are provided at each campsite, we encourage visitors to conserve wood and protect the environment by minimizing the use of fire and using campstoves instead. Please check for campfire bans for the area you are visiting before igniting a fire in the backcountry. Limited burning hours or campfire bans may be implemented. To preserve vegetation and ground cover, please don’t gather firewood from the area around your campsite or elsewhere in the park (this is a ticketable offence under the Park Act). Dead wood is an important habitat element for many plants and animals and it adds organic matter to the soil. This park has one pit toilet. A rustic campground accommodates approximately 20 people in two sections. Facilities include fire rings, picnic tables, and an outhouse. Wilderness, backcountry or walk-in camping is allowed, but no facilities are provided.